A major kernel update has been released from Canonical for Ubuntu 14.04 Trusty Tahr where about 13 vulnerabilities that has been discovered by developers and hackers have been patched. Canonical has asked the Ubuntu users running Trusty Tahr LTS to update their system immediately. Updating your kernel package to linux-image-3.13.0-83 (3.13.0-83.127), linux-image-3.16.0-67 (3.16.0-67.87~14.04.1), linux-image-3.19.0-56 (3.19.0-56.62~14.04.1), or linux-image-4.2.0-34 (4.2.0-34.39~14.04.1) will ensure these patches. You can update your kernel by following these steps. Open Unity Dash > Software updater and run the application. It will check for the updates that are available for your system. 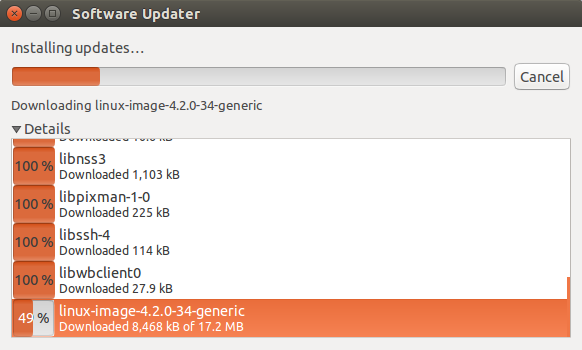 Once done, it will notify you the updates available and will ask you for update along with the size of files needed to be download. I have started the update to be installed and as you can see below, linux-image-4.2.0.34-generic is being downloaded and installed in my Ubuntu 14.04 which contains this Kernel patch. You are doing that on your own risk though. Ubuntu Kernel Team Daily Build PPA - this PPA typically contains experimental packages. The quality of these packages is such that you had better know what you're doing. Don't come crying to the kernel team if it kills all of your kittens. Some of the third party modules may need to be built again, after the kernel update. Have you updated your Kernel?